New turn! Time to look at all the exciting battles I lost! Namor was my group off to the east attacking the fort, I lost a decent number of slings to what looks like a stack of PD. Meanwhile I kill the merc group Dexanth hired without too much fuss. :Smaug: was not so lucky. 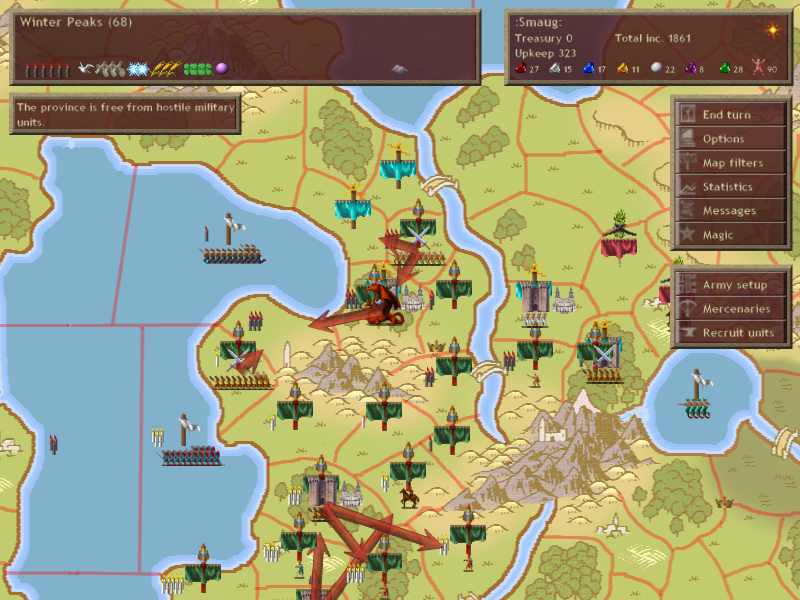 He had almost fully cleared the PD from Arco's capital when he got hit with two afflictions from random spearmen. One of which was a disease. Remember what I said about how your god's max HP goes down while in hostile dominion, and how the rate at which you gain afflictions is based on your max HP? Yeah, this is that in effect. 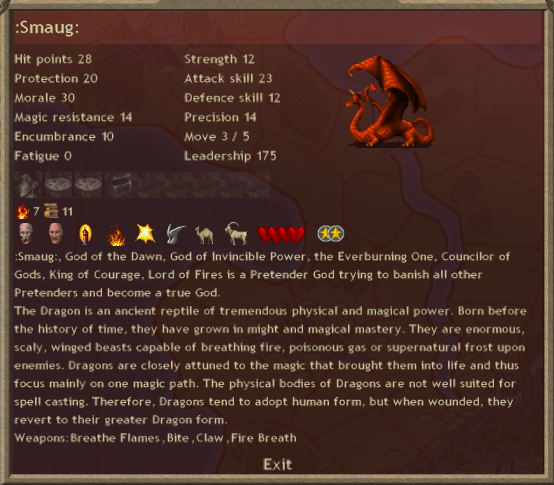 :Smaug: only has 25 max HP in combat, and he flew in with something like 275, so he has a lot of chances to gain afflictions when fighting in such hostile dominion like this. Unfortunately he got both diseased and a limp. What this means for :Smaug: is that he can't really be used in long term raiding anymore. He won't heal when I send him back to friendly dominion because the disease is preventing it, so at best I have a few opportunities to grab provinces before I have to give up raiding with him entirely. 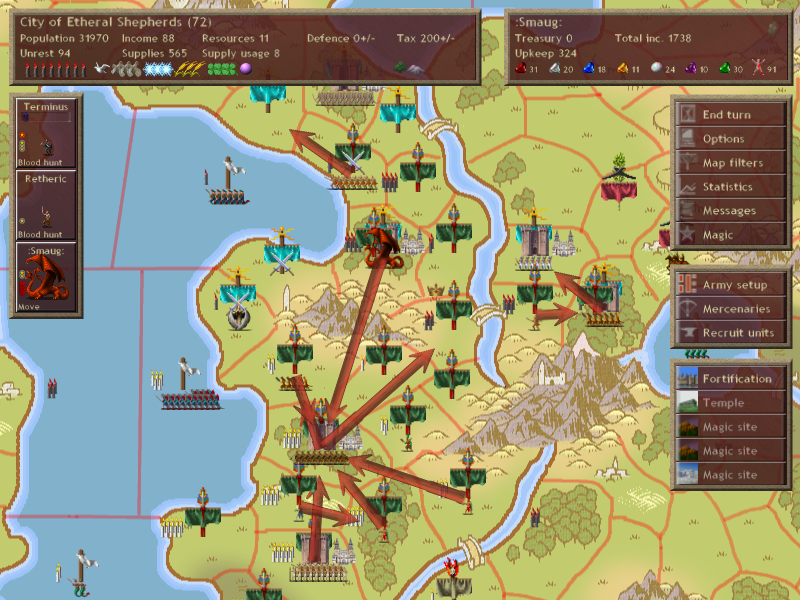 As such I decide to move him off of Arco's capital and help my army take the province with a ridiculous amount of PD. 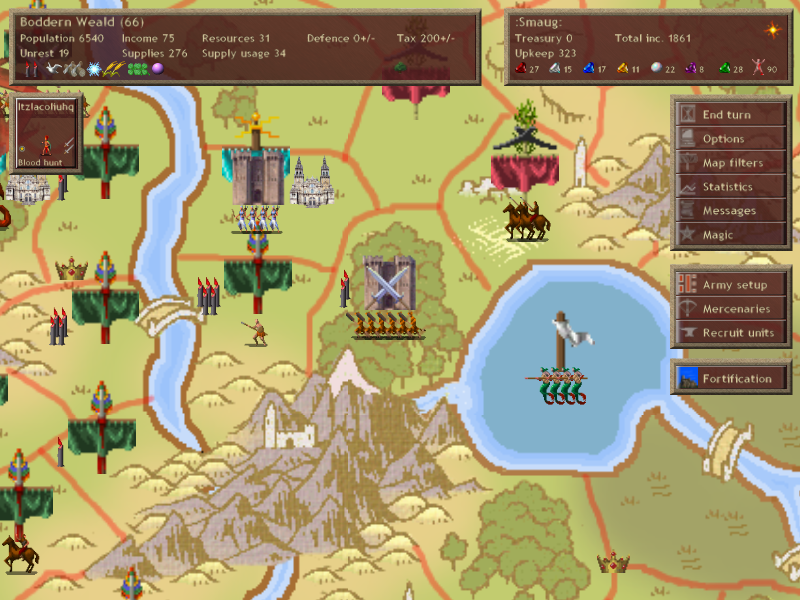 Also, my blood hunting provinces rolled unluckily with regards to unrest for the past two turns. I decide to have one of my priests site search for provinces to help lower the unrest slightly. It won't do much, but it's at least something. Unrest absolutely kills blood hunting chances. And additionally, the fort of Arco's that I sieged out east, I blood hunt it in addition to overtaxing it, both of these contribute significantly to raising unrest. Ideally I would like to prevent him from using his fort for a turn or two after I move off of it, and I get some blood slaves to use in combat this way. Oh boy, that's not good. The battle report that appears above my mages site searching attempts, that indicates a magic phase battle. 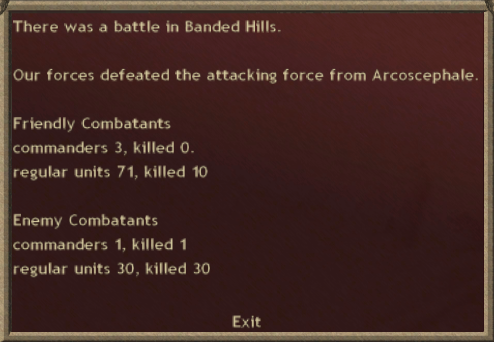 It means that Arco (or I suppose someone else, but really its going to be Arco) has teleported a unit onto one of my provinces or armies. Its possible that it's an oreiad or group of oreiads, but I know Rainbow Dash is capable of doing this, so I'm going to bet its her. Yeah, that's Rainbow Dash all right, and she's geared to the teeth this time. In order from left to right her gear is a fire brand, vine shield, empty slot, rainbow armor, birch boots, luck pendant, and an antimagic amulet. 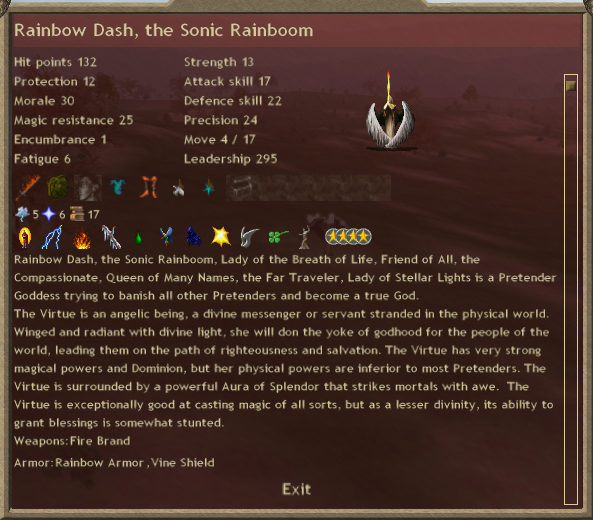 Additionally, her paths let her add some other spells that will help her survivability significantly. The primary things of note in her gear set are the fire brand and vine shield. The fire brand adds 50% fire resistance on top of her innate 50% fire resistance to make her immune to flaming weapons (and other fire based attacks). 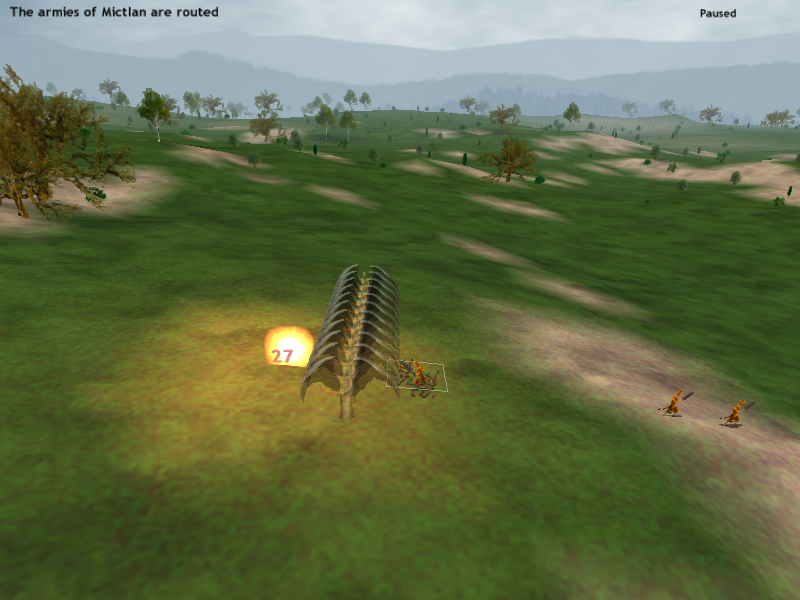 Flaming weapons is a useful second attack, but more importantly its a magic attack. So it pierces things like mist form and body ethereal. Both of which Rainbow Dash will be relying on. The vine shield provides very powerful crowd control. Any unit that attacks her is entangled by vines and has to break free before being able to act again. So it is a fantastic way to significantly reduce the number of attacks on her from sources like jaguar warriors. Everything else just boosts her defenses or survivability in some way. Very few survivors make it out alive. 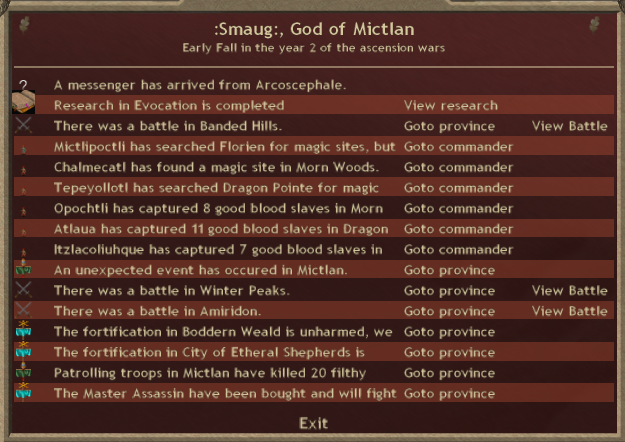 Additionally, she teleported onto my army that was moving into the same province :Smaug: was attacking. However, since she scattered it, they do not follow through with the attack. This means that :Smaug: is left to try and take the province alone. Unfortunately, against that much PD he is not victorious. He routes with 28 hp left and a whole slew of new afflictions. Including a chest wound, which pretty much ends his career as an SC entirely unless I can heal it. I fly :Smaug: back to friendly territory. Since disease does 1 damage a turn outside of combat, he can survive for at most 28 more turns, but I might as well use them to make him do something useful. I had hired an assassin to kill a commander or two of Arco's, but then I remembered you can't assassinate the commanders inside a fort if you're sieging the fort. To make matters worse, a fire destroyed my laboratory in Mictlan this turn! All of the mages in my capital now aren't doing anything this turn. I decide to move my moon priests up north, have my sun priest rebuild the lab, and all of the priest kings can hunt for slaves. It will at least give me some patrol fodder, and they're not standing around doing nothing this way. 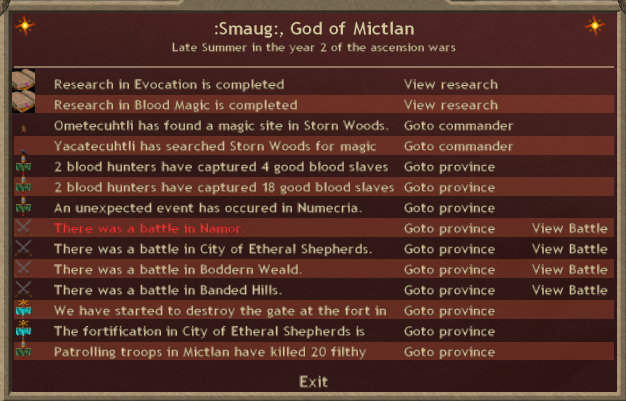 Turn 18, not a good turn for Mictlan.